From left to right: Gardner Marshall, York Fire Chief Chris Balentine, Oceans Rescue International Joe Mokry, Chris Connors, Luke Starkey, Wayne Avery, James Eslinger, David Butler. This is the beginning of my friendship with Chris Connors. "Are you interested in water rescue? Do you have a rescue boat? Do you think there would be interest in this?" These were just a few of the questions being asked of me by my new "friend" who came in LITERALLY off the street, sight unseen, until this magical day. This was almost 14 years ago. At first I was skeptical about his intentions, but as I got to know Chris I found out "this is real" and he is VERY genuine in his friendship and with his ideas. 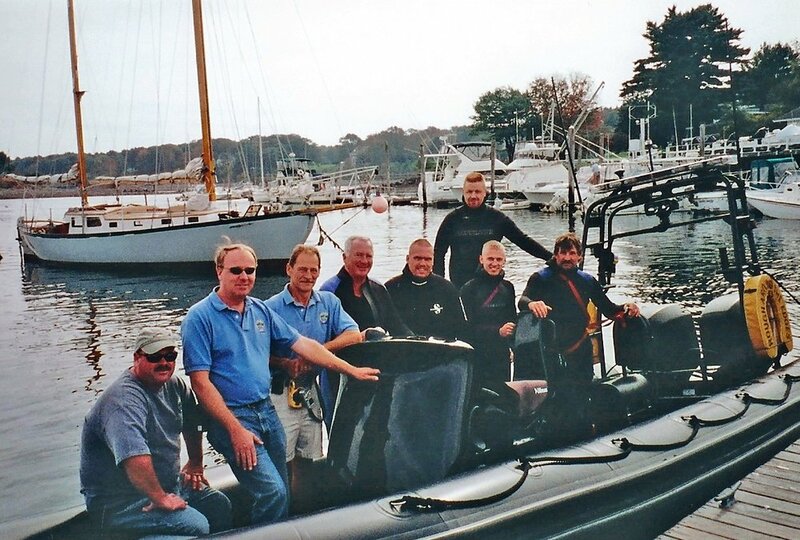 Up until now we relied on the York Harbor Marina, so when a boat/rescue call was received, the York Fire Department would respond to the marina and either take one of their boats or they would pilot one their boat to answer the emergency call with our people. One of the marina boats was called the "Backbreaker" and it was a work boat for the Lusty Family who own the marina. They were always very generous to us in the use of this boat and their employees were boaters who were skilled in the boat and operations on the water. This was the rough beginnings of a water rescue team, although no formal procedures were in place and no formal training was in place either. Shortly before Chris Connors arrived in York, the "Backbreaker" was sold. Chris's timing was coincidental in that we had no boat and no formal water rescue program to offer to our fishermen who work out of York Harbor and to our recreational boaters and tourists. Chris actually spent a lot of time researching water rescue boats and settled on Ribcraft out of Marblehead, Massachusetts. We made several trips there together and studied Ribcraft's offering, eventually settling in on a boat that could do the job--a lot like the boat we have and use for water rescue today. Thanks to the boat Chris donated the Fire Department got a fully-equipped water rescue boat, a fully documented training program, certified boat handlers and rescue swimmers, a great team of men and women who are dedicated firefighters, a berth for the boat, and full cooperation with York Harbormasters on the entire program. Chris brought along Joe Mokry, founder of Ocean Rescue Systems International, and he has been our trainer since day one. Soon the interest began to grow and the training was fun. Chris Connors actually purchased three boats in the early days. We had used the first boat that was too small and underpowered. The first boat was replaced with boat No. 2, which was nicknamed the "stealth boat" as it looked like a Navy Seals craft with big engines and it was a tremendous boat with lots of power, but in most rescue situations, this was too much boat for our needs. We then went back to Ribcraft and Chris made arrangements to obtain boat No. 3, which, in some ways, was "right sized" for what mission we needed to accomplish. The program was further enhanced by the cooperation of our great friend Harbor Master John Bridges, who set in motion the allocation of a prime berthing spot at Town Dock No. 2, which we still maintain today, along with a great program. We now have upwards of 12 water rescue calls per season and some documented saves. All of this has been made possible by the cooperative planning and thinking beginning with Chris Connor's idea of providing a valued service to York and surrounding areas.